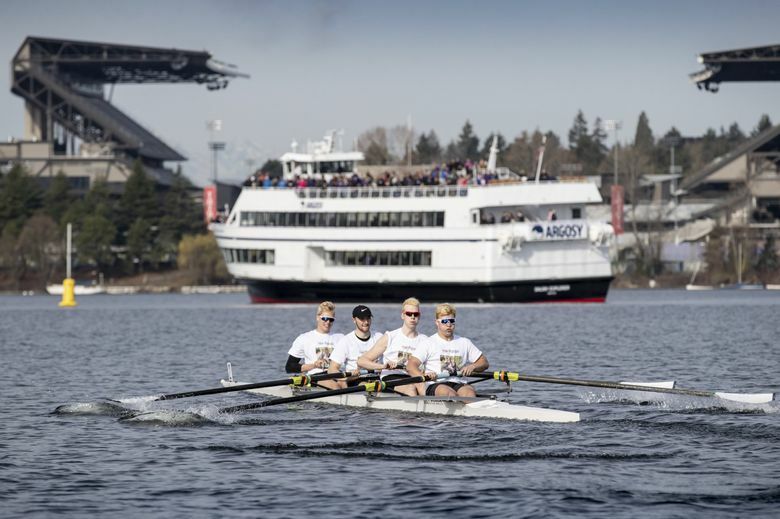 With a win already on their records, the Washington men’s and women’s rowing teams honored history Saturday by racing in the 118th edition of the Class Day Regatta, the traditional kickoff of UW’s rowing season. In close to ideal conditions on the Montlake Cut (partly cloudy skies, mid 50s, fairly smooth water, a slight tailwind), the senior men’s eight convincingly duplicated their 2018 win as juniors by claiming the George Varnell Trophy with a two boat-length victory over this year’s juniors in a speedy 5 minutes, 36.48 seconds —20 seconds faster than their winning time last year. 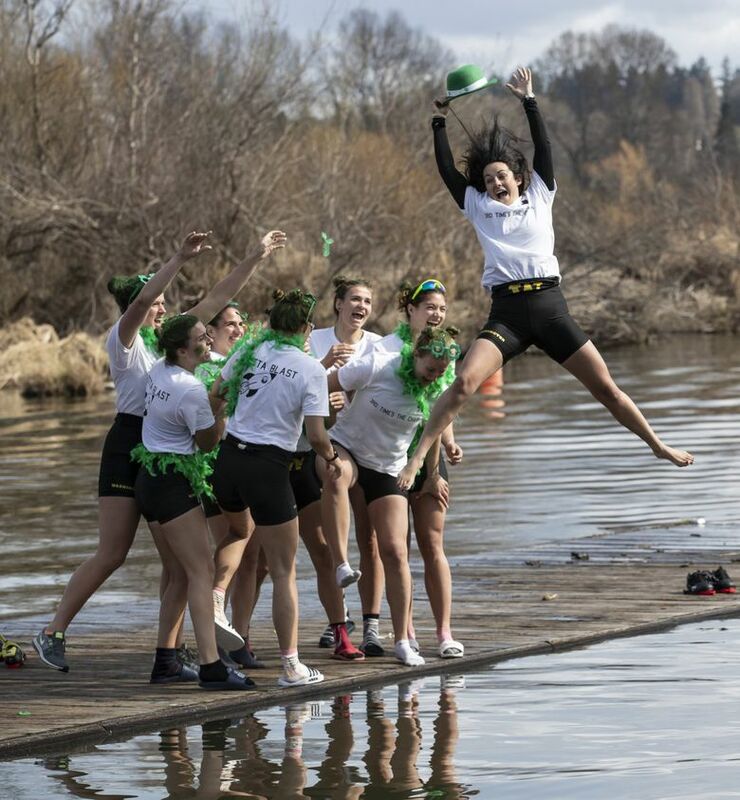 The junior women’s eight — with a lineup that included Molly Gallaher (a Skyline grad, fifth seat), Emma Vagen (Kentwood, second seat) and Skylar Jacobson (Steilacoom, bow) — earned The Seattle Times Trophy with a six-seat victory over the seniors in a time of 6:19.338. So begins another season with national-championship ambitions for both teams. Both are ranked No. 2 in early-season polls, and both recorded wins March 2 at the Las Vegas Invitational three years ago. Both finished second at their championship events last June. 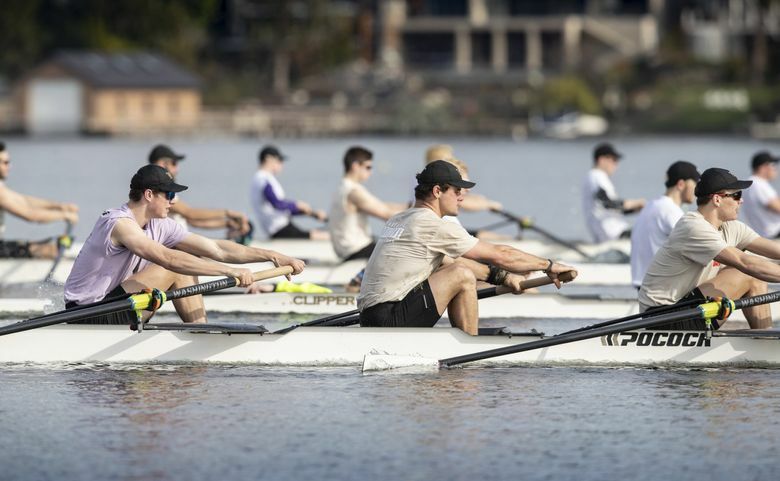 At the Intercollegiate Rowing Association Championships, the UW men finished less than three seconds behind two-time winner Yale. The women, who won the 2017 NCAA title in their first year under coach Yasmin Farooq, placed just two points behind California in last year’s neck-and-neck NCAA championship team standings. The UW men won five straight IRA championships between 2011 and 2015. Coach Michael Callahan, entering his 12th season, views his 2019 squad as a serious contender for the top step on this year’s championship podium. He views the strong showing by his seniors Saturday as a good sign. Four were members of the American eight-man crew (coached by Callahan) that last July rowed to a gold medal at the World Rowing Under-23 Championships in Poland: seniors Madison Molitor, Andrew Gaard and Chris Carlson, and junior Samuel Halbert, a Woodinville graduate. 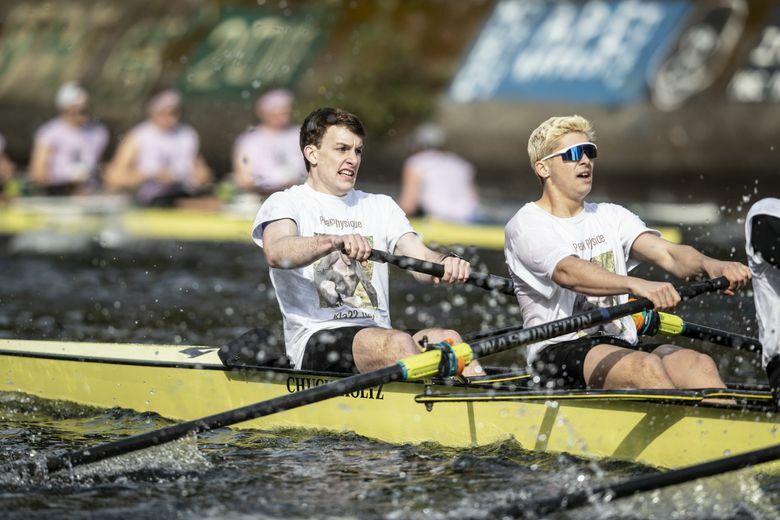 Gaard, whose name provided the inspiration for the pirate theme (including on-board inflatable swords) displayed Saturday in the senior boat, was named USRowing’s U-23 male athlete of the year in 2018. Carlson, Callahan says, ranks as the strongest rower in the U.S., collegian or graduate, on the ergometer. Callahan, who’s squad was ranked No. 1 for more than a month in 2018, is eager to end UW’s two-year streak as runner-up to Yale. “We have that artificial ceiling, and we’re challenging this class to break that,” he said. “They have the capabilities to be a championship-level crew, but they have to be able to do it on the last day. Farooq is emphasizing an advanced work load for her rowers to give them a championship-day edge. 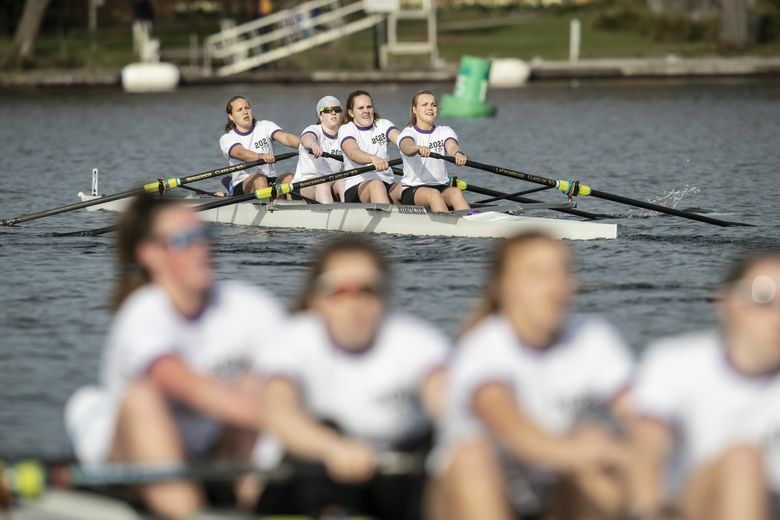 Most of her athletes began competing hours in pairs racing at 7 a.m. Saturday, hours before the regatta. Two-a-day practices are routine. The women compete at the San Diego Crew Classic April 6-7 where the field includes No. 1 California, No. 3 Stanford and No. 4 Texas. The men row vs. Oregon State and at No. 13 Stanford on April 6. 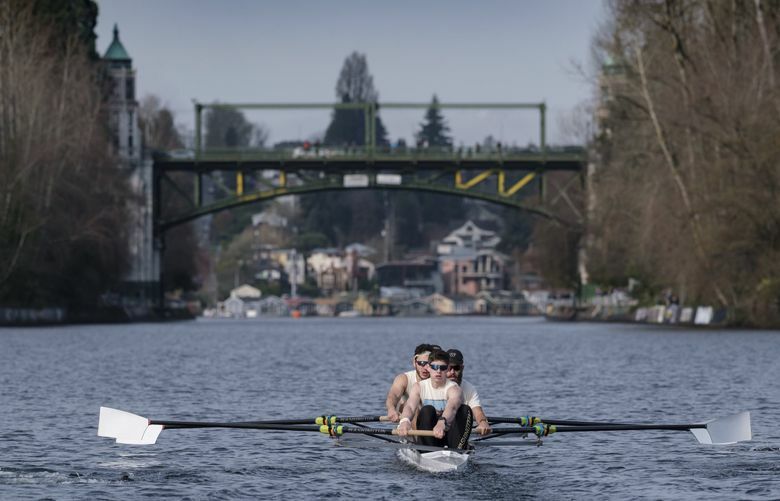 The annual Cal dual is split, both on Montlake Cut: the men on April 20, the women April 27.